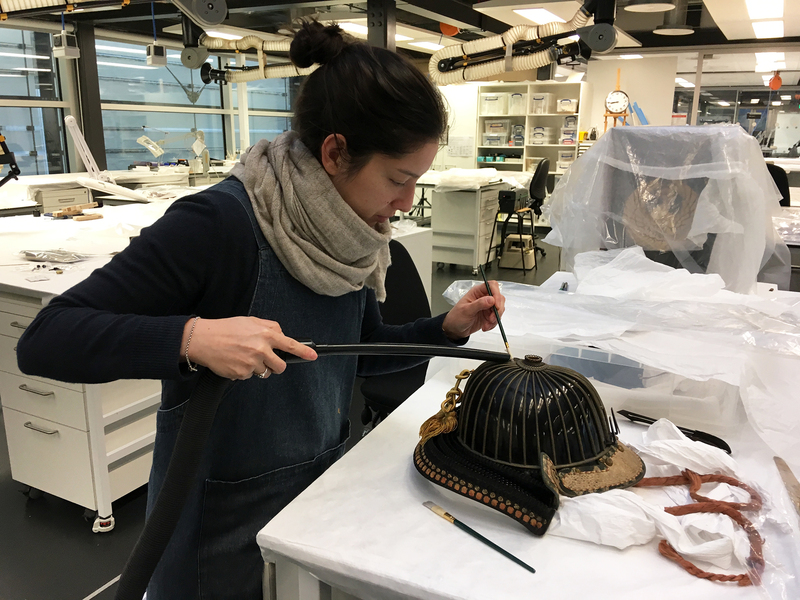 Organics conservator Tania Desloge discusses the conservation work undertaken on the newly acquired set of samurai armour that showcases in the refurbished Mitsubishi Corporation Japanese Galleries. Using funds from the JTI Japanese Acquisition Fund, the Department of Asia has recently acquired a fine set of Japanese samurai armour and accessories dating from the 1700s. During the Edo period (1615-1868), Japan was largely at peace, so armour was more for ceremonial occasions than for battle. It was a beautifully decorative ensemble of finely crafted materials, including metal, lacquer, textile, leather and horn. Each of these presented different challenges for the team of conservators at the British Museum. 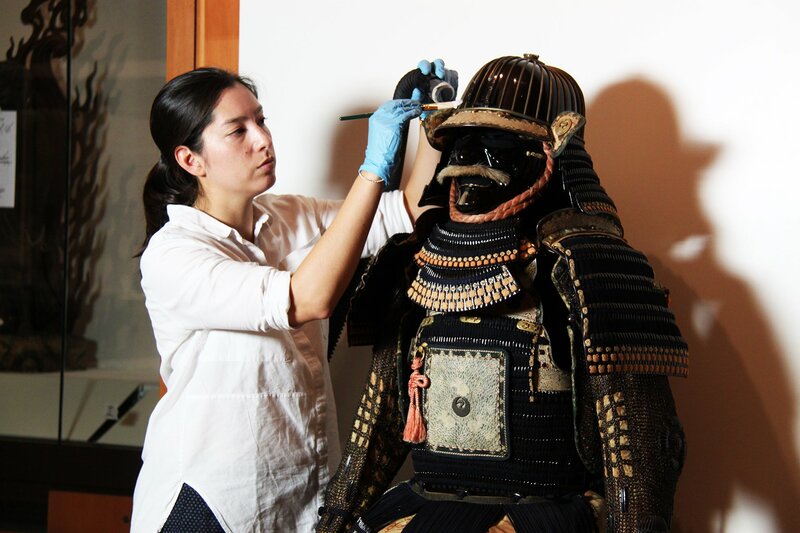 The samurai armour required extensive conservation and mounting before it could be put on display. This is because it had been privately owned with no known previous conservation records. After initial assessments it was clear that it was covered in dirt dust, had damage to the lacquer, degrading textiles, and needed structural support for mounting. During its 250+ hour treatment we learned a lot about the techniques used to create the armour, with some interesting surprises along the way! 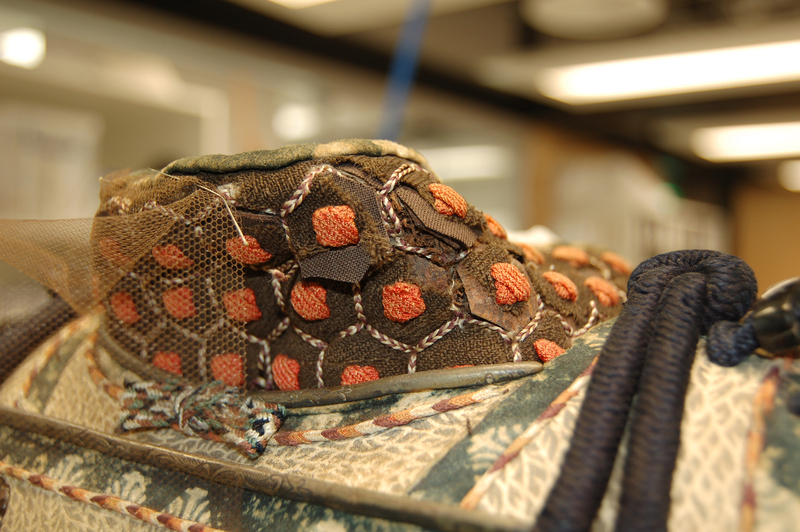 Samurai armour photographed before it underwent the conservation process. The crest of a dancing crane seen in several places on the armour is that of the Mori family of samurai lords who ruled the Akō and Mikazuki domains in Harima Province (modern Hyōgo prefecture) in Western Japan. When the object arrived at the Museum it was quarantined for several months to ensure that no pests or infestations were present. Usually objects will be frozen to kill any insects, but due to the amount of lacquer and metal (which can break when quickly expanding or contracting due to changes in temperature), quarantine was the best option. Many of the wood and horn pieces from the armour and its storage box showed signs of damage by pests. While wood damage can be seen as unsightly, interestingly some horn damage can be seen as a sign of affluence—that the owner was able to afford real horn as opposed to a substitute. This horn toggle was eaten by pest and this has weakened the toggle considerably. One of the first things we did was clean the armour. There was a lot of dust in crevices that could scratch the surface when trying to spruce up the metal. We used a soft brush and a special Museum vacuum to carefully clean the dust off. Tania performing a surface clean of the helmet to remove unwanted dust with a brush and museum vacuum. During a surface clean conservators can uncover partially obscured surfaces, helping us gain a better idea of the object’s overall condition. For example, while cleaning the cuirass over 100 insect casings were found hidden beneath the silk cording. 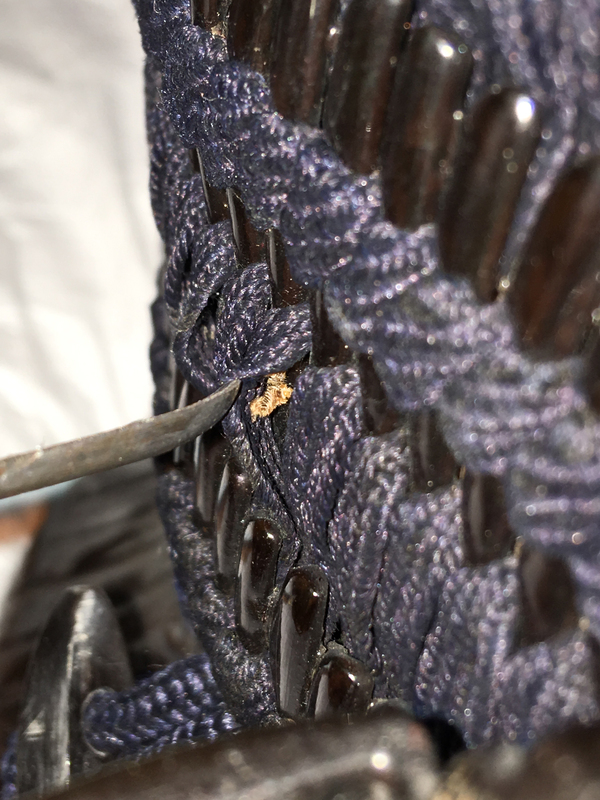 Insect casing was found behind cord while cleaning the armour. The armour has several textile elements including the collar, shin guards, silk cords, tassels and sleeves – many of which had degraded over time and from light damage. Light damage fades dyes, and weakens the fibres causing them to split and disintegrate into fibre dust. 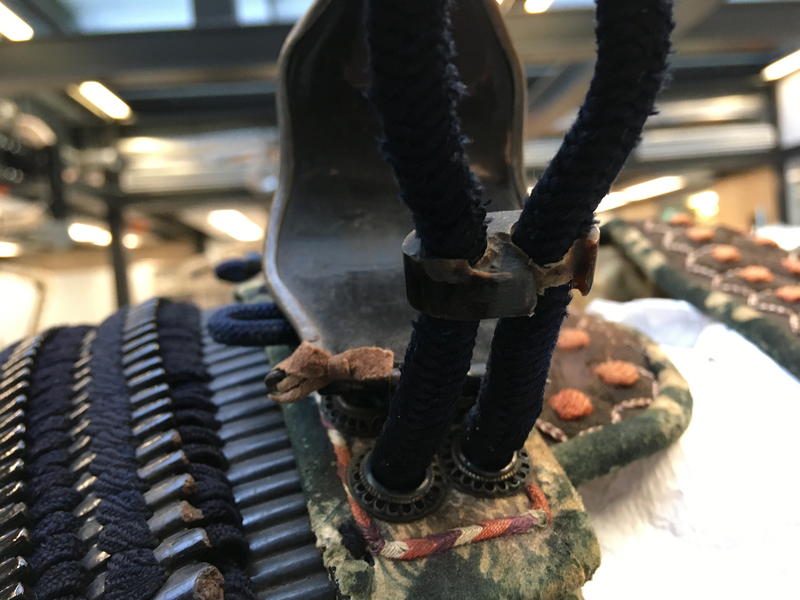 The parts dyed a light orange/pink colour were especially damaged so our senior textile conservators set to work securing the loose fibres by using very fine silk thread and custom-dyed nylon netting where the armour needed additional support. 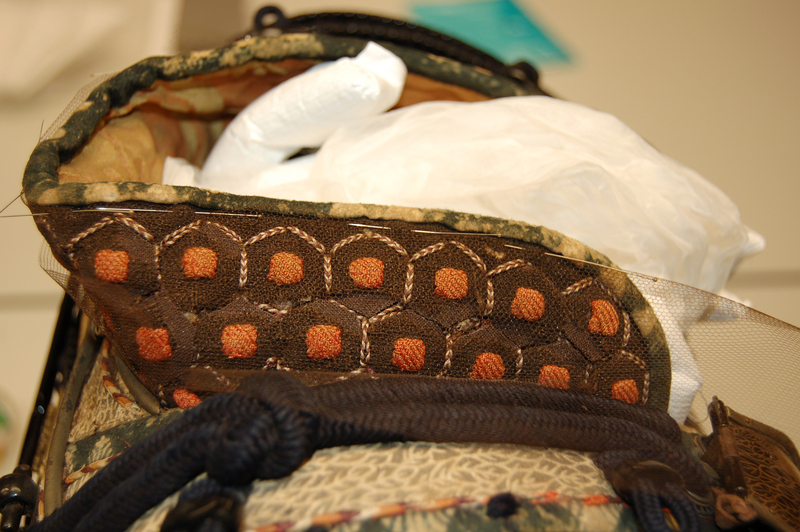 The collar before conservation with damaged textile showing the metal underneath. Senior textile conservator Anna Harrison had started to insert dyed fabric to secure the loose metal and place netting over the collar. Here the collar is now stable and only needs stitching around the edges to finish the treatment. The netting placed on top is now nearly invisible to the naked eye. Our main concern was the lacquer covering nearly all of the armour. When lacquer is new it’s glossy with a smooth, shiny surface that is resistant to most environmental conditions. But over time light can damage lacquer and create tiny microcracks in the surface, making the surface appear dull. The armour had many areas with cracks that needed treatment to protect the exposed areas and prevent any more damage. Because the adhesive we use dries very slowly (it takes over five days), it is important that any area we are trying to stabilise has continuous pressure. For this, we use a modified Japanese method called shimbari – it utilises a wooden frame and flexible bamboo sticks that allow the conservator to apply even pressure across an entire surface, whether flat or curved, over a long period of time. Coupled with clamps, we were able to re-secure lacquer that no longer lay down flat. (Left) The end of banner that shows chips in lacquer and some raised edges that need to be flattened. (Right) Use of the shimbari technique by UCL conservation intern Netanya Schiff on the banner to keep continuous pressure on areas being treated. Conservation also requires research and analysis of an object to make sure its components are properly supported and treated. We knew some of the lacquered plates had a metal interior (easily found out by placing a magnet near them), but we were unsure of how many might be rawhide (stiff leather). With the help of the Science department we X-rayed the armour to see the hidden material underneath the lacquer. It was amazing to see the attention to detail revealed by the X-ray. The use of rawhide and metal changed depending on the amount of strength or flexibility needed in a particular area. X-ray showing side of cuirass (breastplate and backplate). The bottom is made from smaller pieces of rawhide (stiff leather) on the sides and attached with small nails. 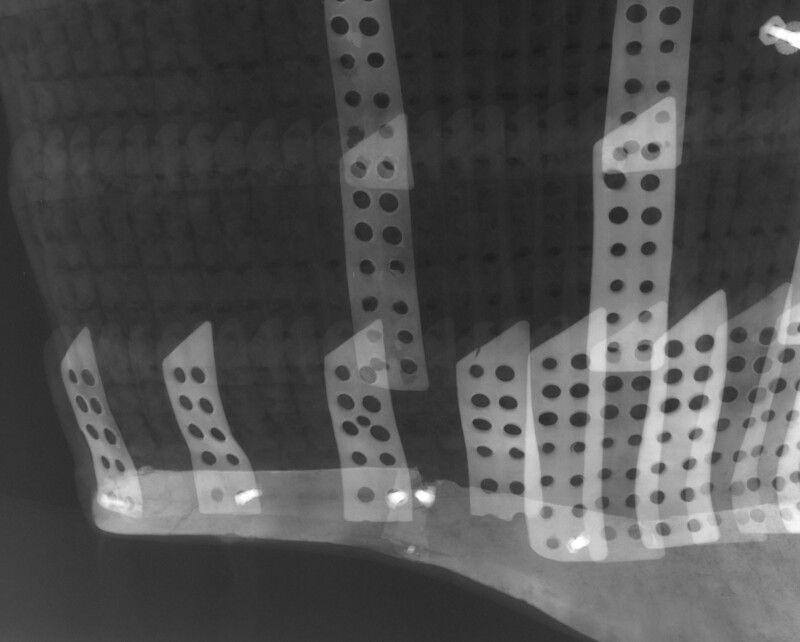 The X-ray also shows which plates are metal (seen as white) and rawhide (seen as grey). After the conservation was complete, the next challenge was to mount the object for not only the gallery, but for its permanent storage. As the armour had so many parts, it was necessary to create a strong mount. This involved using the traditional wood frame on which the armour was previously mounted, padding it out with dense blocks of wadding covered in jersey and silk for support. 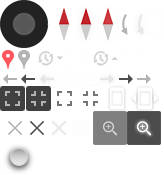 Individual pads were made to help add shape and protect places where the armour might scratch other pieces. Senior Textiles Conservator Katy Smith adjusting pads for the heavy lacquered skirt. We realised that the previous mounting had allowed for too much space between the pieces –the armour looked as if it had a very long torso and shorter bottom half. After finishing with the new mount, it became clear that the armour pieces should be fitted closely together. The finished article on display. 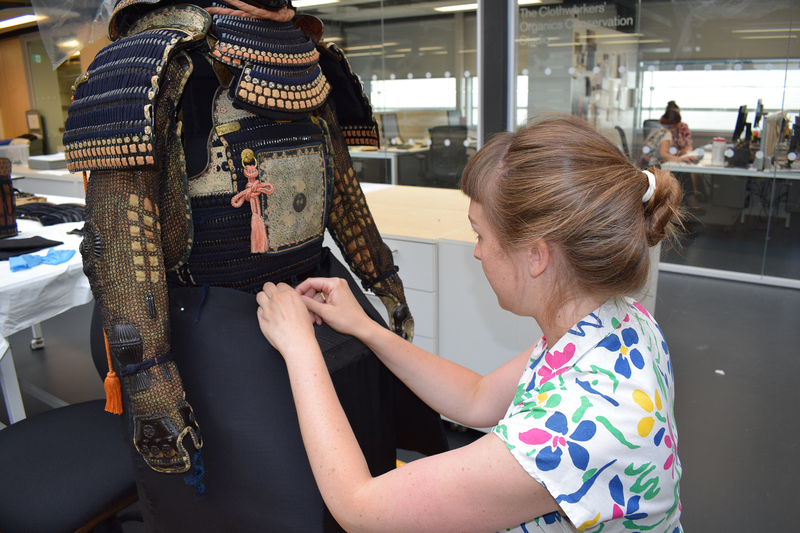 After nearly eight months of painstaking conservation and over 250+ hours of work, you can now see this newly acquired samurai armour in all its conserved glory! 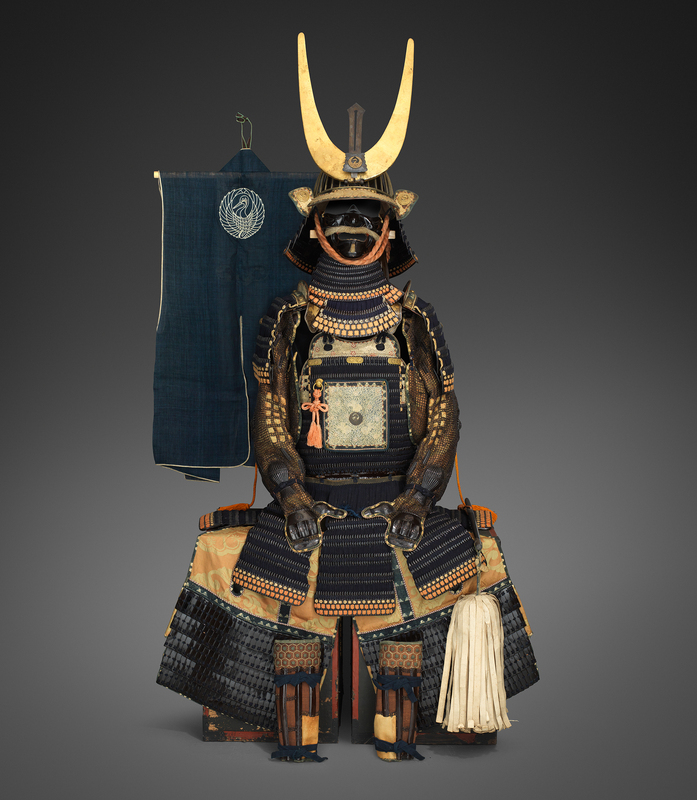 Purchase of the new samurai armour was made possible by the JTI Japanese Acquisition Fund. 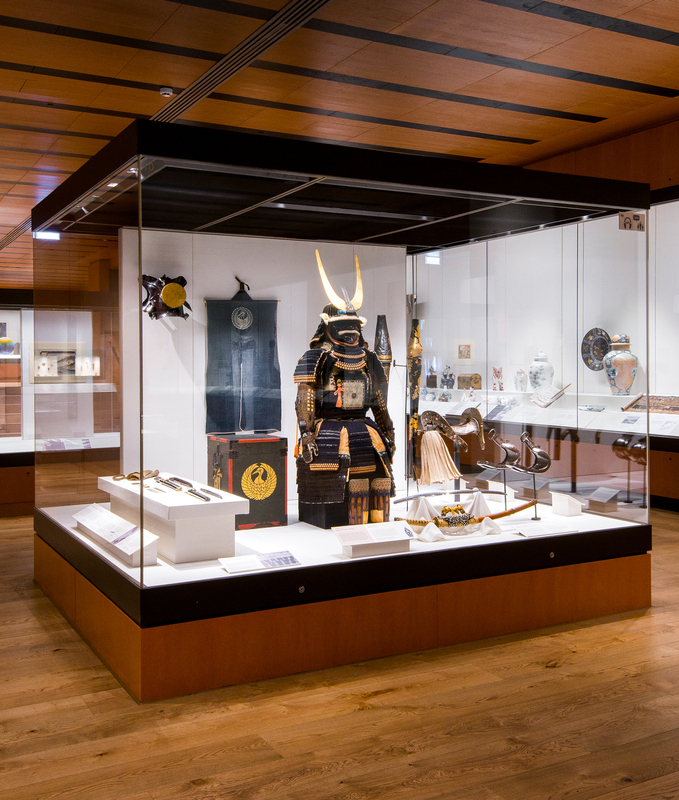 The newly refurbished Mitsubishi Corporation Japanese Galleries re-open on 27 September 2018. Find out more and plan your visit.